People who have been away from their families for many years by choice or circumstance, can instantly feel the pain and courage presented in the film “Prodigal Daughter,” by Mabel Valdiviezo. Everybody will feel inspired by this powerful story lived by a Latina woman and told in first person. It is a documentary where Valdiviezo shares her struggles to become a happy, integrated human being again. “Don’t Die With Your Dreams,” she tells herself at a low point in her life. And so she goes back to her natal Peru, after 16 years of absence in the midst of a myriad of events in which she was the protagonist. From becoming undocumented to “having to learn to walk in the valley of shadows,” as she calls it, to getting involved with drugs and other situations far away from her dreams of success. A part of it was making the reality the so-called American Dream, by which millions of people from Latin America and elsewhere come to the United States, expecting to progress in life. The film was shot in 2009 and after, and it follows Valdiviezo as she reconnects with her family again, telling us what happens when the now artist, filmmaker, and woman in tech was diagnosed with cancer; equality important is that it shows what she did to rise again. It is a tear-provoking documentary, but it will leave you inspired. The film has been screened privately as “work-in-progress,” at UC Berkeley’s Summer Institute on Migration and Health, and it has been invited to be shown around the country -once is finished. UC Davis has scheduled an “as-is” screening for October 23. 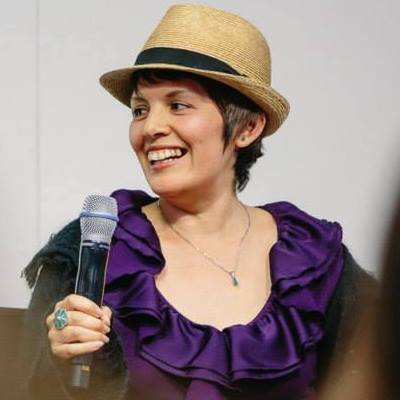 To finish the film and pay for the work of editors and other film professionals involved, Valdiviezo created a crowfunding campaign on Beacon: Prodigal Daughter. Anybody can give $1, $50, $25, $50 and more to her documentary. The campaign ends in 4 days and it 85% close to its goal. it is crucial to get funding before the campaign closes with 100% support, otherwise, all funding will have to go away. This is a great, positive opportunity to be of support to others; if is true that we are all connected, helping make this film a reality will strengthen us all. More importantly, it is an opportunity to journey with Mabel, as she heals and succeeds in her life-quest through art therapy, facing her demons and sharing her life with courageous honesty. -Mabel Valdiviezo, filmmaker, Prodigal Daughter. Written by Lupita Peimbert. Pictures courtesy of Mabel Valdiviezo. Previous Oaxaca With My Tía Margarita. Next Here is Something about Hispanic Heritage Month.